The research that led to the Theory of Well-being in Refugee Women in Cultural Transition would not have been possible without the help and guidance of Rebecca Mabior and John Akuei, my friends, translators, and interpreters. They have not only served as culture brokers between the South Sudanese community and myself, but have become part of our extended family. John and Rebecca came to the US in 2001 as refugees. John was one of the Lost Boys of Sudan from the Kakuma Refugee Camp in Kenya. Rebecca came from Khartoum, the capital of Sudan, where she was practicing as a registered nurse. 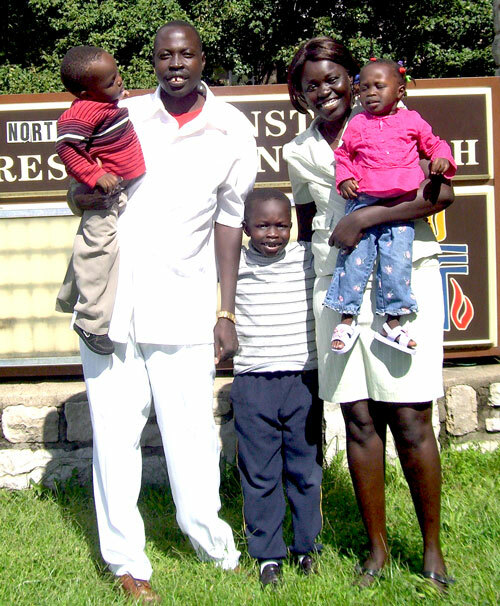 She and John met in the US, married, and have three children Atem 8 years, and Akon and Akuei, 3 year-old twins (see family picture). Their families still live in South Sudan and have never met their three children. Since South Sudan became a separate nation on July 9, 2011, they are able to visit their homeland for the first time in over 10 years. Next year, their oldest son, Atem will meet his grandparents for the very first time. Working with the Sudanese refugee community on these two research projects has taught me the importance of long-term and sustainable relationships with the communities we are serving and hoping to effect positive health change.